This is the second post in a three part series written by Ecole Chocolat graduate Brooke Willis of B Cocoa Artisan Chocolates. We asked Brooke to share her story and all that she learned along the way as she designed her chocolate brand and launched her business, including where you can DIY to save some money during those early days! You can read the first part of Brooke’s story here. Now let’s dive in to part 2 where Brooke shares her advice about designing a great logo! 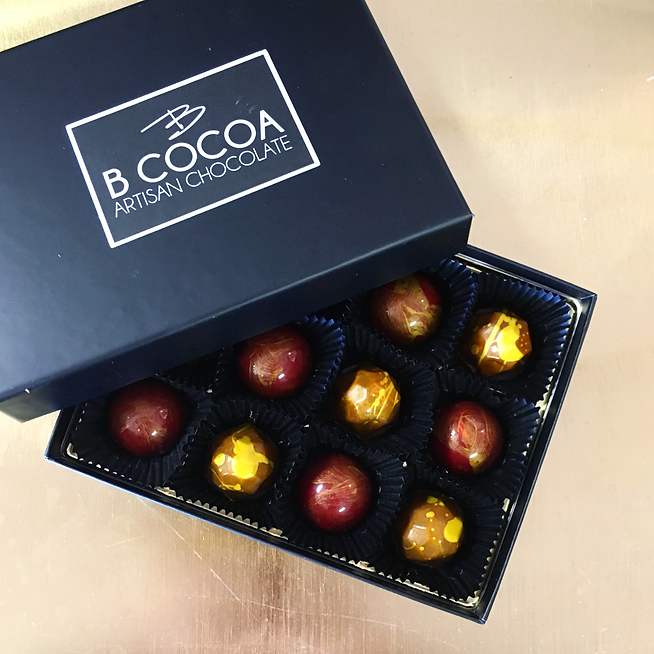 Once I had a name, B Cocoa Artisan Chocolates, all the fun began. A logo or brand identity mark is where a company can showcase their unique style. Just like a bad name, a bad logo can be a disaster for a company! Chocolate is not only about taste, it is also very visual. We eat first with our eyes. Just as I was instructed in the Ecole Chocolat Professional Chocolatier course, I took direction from other companies I admired. I looked at stores, logos, companies websites, etc. My logo was inspired by a famous chocolatier. I’ll add bonus points if anyone can figure it out. There’s a hint in the first post in the series. Also, I feel that the more simplistic and clean the logo the more freedom you have with it. Is it visually pleasing and balanced? Can I use my all or part of my logo to brand other things like shirts, aprons, boxes, ribbons? Can I update my logo without compromising my brand identity? I created a logo for B Cocoa where I can separate out just the B to brand products or I can go with just B Cocoa or use my full name, B Cocoa Artisan Chocolate. I can also interchange the colors to adjust for holiday packaging. One day, I’d love to have my small, intimate chocolate shop where I sell chocolate, coffee, light bites and locally made products and gifts. That is why I decided on B Cocoa, it doesn’t limit me to only chocolate because I can expand without compromising my brand image. I keep the full name with B Cocoa Artisan Chocolate for my chocolates and use only B Cocoa for my other products and services and my brand is still identifiable. If you don’t have the time or desire to create your own logo, I recently found a great design site that is also inexpensive and I recommend it if need help developing a logo. Visit www.tailorbrands.com, they claim you will have a logo in ten minutes. I decided to put my company name in there and see what they came up with and they were nice designs. The only downside of this is that you are not getting a personal custom design, and you could potentially have a logo that is similar to someone else that uses the program. If all else fails… and if you have a design savvy friend, ask if you can trade you chocolate for their services, I’ve never had anyone turn me down for a chocolate payment. Before I went “public” with my brand, I decided to test it out. For Christmas, I made chocolate boxes for my children’s teachers and my friends and family as gifts. Now that I had my name and logo I settled on a simple and clean packaging which was all black with my logo sticker placed on top with a black satin ribbon tied in a bow. I took my chocolate to my daughter’s school party and within ten minutes had parents and teachers asking me how they could order my chocolate for Christmas gifts. By the end of the day, I had sold all of my chocolate that I intended to give as gifts to friends and family. I was shocked. I didn’t expect a reaction like that. By the end of the month, word had gotten out that I make fine European chocolate locally and I had my first corporate order for fifty boxes of truffles for a medical sales company in Dallas to gift their clients for Valentine’s day. That was a little over a year ago and less than one month after I started the company and B Cocoa has continued to grow and flourish more than I ever anticipated. Now… I know chocolate costs are considerable, as well as all of the start up for a new company; however, I truly believe that presenting yourself and your company professionally will always pay off in the end. I saved a ton by designing everything myself. To further cut my costs, I found a great packaging company, and I use folding boxes instead of rigid boxes that I set up myself. This also helps save on storage space and shipping costs. I have a simple photo printer and print all my packaging labels in house and I have a great wholesale printer that I can use for business cards and other printed goods. I know not everyone has the time or resources to do everything in house but if you can cut small costs early on, it can help in the long run. Once I had my name, logo, design, color scheme and packaging I started a Facebook page to get a larger audience, build my sales, further test and tweak my brand so that I could develop a consistent website. Stay tuned for Part 3 and tips about designing your website! Thank you so much to Brooke Willis for sharing the story of developing her logo! In the next post, Brooke will share her tips for developing her website! Did you have a hard time developing your logo? Did you use a professional designer, or did you do it yourself? Tell us in the comments section!